"The Nazism of the Jews does not skip women and children, it scares everyone. 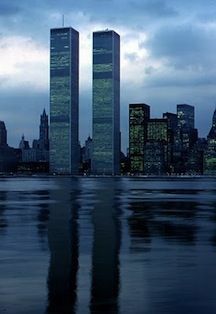 They make war against people's livelihood, plunder their moneys and threaten their honor … They took advantage of key elements in unfolding events, and accumulated a huge and influential material wealth which they put to the service of implementing their dream …." (Jews) control of the world media (and use their) wealth to stir revolutions … They stood behind the French and the Communist Revolutions." "There was no war that broke out anywhere without their (Jews') fingerprints on it." 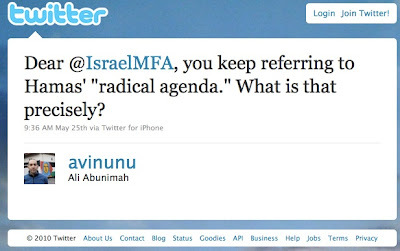 But hey, calling for hatred, violence, and murdering of Jews and the destruction of Israel isn't really a "radical agenda" according to Mr. Abunimah, apparently. But Mr. Abunimah knows all this already. He knows Hamas is a radical Islamic, Jew hating terrorist group set upon murder and the destruction of Israel, yet he is in the business of intellectually dishonest anti-Israel propaganda, trying to make it appear (somehow) that Hamas is not Hamas. It does not matter how many facts you can throw at someone intent on slandering Israel and the Jewish State. People who cannot even admit that the agenda of Hamas is "radical" are clearly not interested in peace. There's no point in arguing or debating with people like this.